The Cat was discovered many years ago by my friend, Andrew Sorrell, proprietor of Floral Hall Antiques in North London during one of his buying trips to the Paris Flea Market. When he phoned to say he had returned with something that might be of interest to me I headed straight round to his shop to find out more. A large cardboard box was standing in the middle of the floor arranged in such a way that Andrew could sweep it aloft – like a magician – to reveal The Cat: standing just under a metre tall on hind legs and proffering an enamelled cast iron umbrella stand within the embrace of its outstretched paws. As Andrew had anticipated I was captivated the minute I set eyes on The Cat: by its look of startled affront topped by moth-eaten ears, its implicit pathos, and overall impression of bizarre incongruity. Since taking up residence at The Library, one of The Cat’s many admirers has been the actor Doug Bradley – who chose it to accompany him in his portrait as part of a series I began in 2005, in which I was investigating relationships between material culture and memory by photographing and interviewing people with objects from The Wildgoose Memorial Library collection. 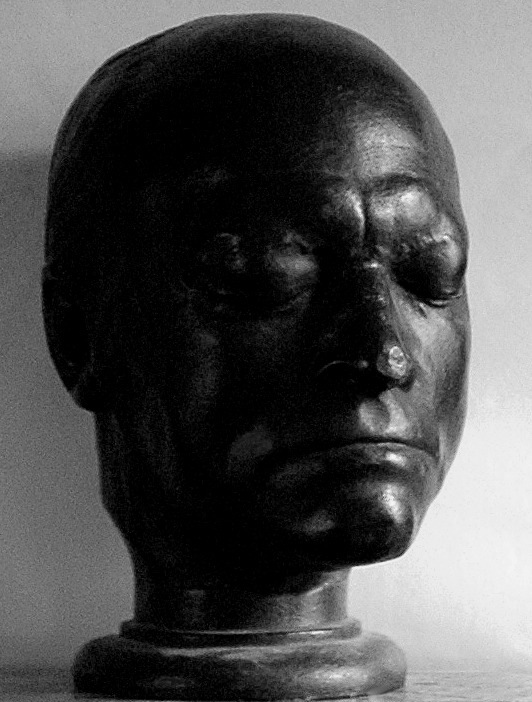 For his sitting Doug also selected a cast of the life mask of William Blake (1757-1827), and seeing the two contrasting forms of specimen afterlife brought together for the photograph it was immediately striking that The Cat (which must have been dead when first preserved) appeared absurdly alive – while the cast made from life seemed really rather cadaverous. That Blake was alive and consenting at the time the cast was first produced, is evidenced by its maker, James De Ville (1777-1846) who – capturing and recording the artist’s likeness as a subject for his records as a phrenologist – helpfully included the date of manufacture, 1823, on the base. However, the weight of wet plaster applied during the process (an experience Blake did not relish) pulled his mouth down and caused his cheeks to sink, lending him a prematurely deathly aspect that distorted and effectively erased any sign of a disposition described as “cheerful and lively” by his biographer Harold Bloom.1 The feline specimen, on the other hand, has been artfully crafted in such a way as to look unnaturally perky, displaying the semblance of a lively – if not exactly cheerful – character. With quizzically tilted head, and beady stare in its tawny glass eyes, the fact The Cat has been captured as an eternally strutting repository for umbrellas – and making this act seem peculiarly natural – is a surreal touch that is a credit to the taxidermist’s skill, if not necessarily to their better judgement. Lacking any provenance for The Cat, I remain blissfully ignorant of the circumstances surrounding the conclusion of its first (or even ninth) life, and subsequent suspension in the current perpetual state of being in which we now find it – though I imagine it was originally produced with a view to being a piece of domestic furniture. And I am left wondering: was The Cat a beloved pet, pressed into post mortem service with commemorative affection? Did it die a natural death? Or was it perhaps assassinated on some mad taxidermic whim? I am also left wondering whether my feelings concerning ownership of The Cat might be affected if I knew more of the detail of such history? Mystery surrounding origins notwithstanding, from the moment The Cat first arrived it settled perfectly into the shadows of the hallway, where it provides a uniquely lugubrious welcome: surprising some visitors into hesitating for a moment of mild hilarity and admiration, whilst others experience a creeping sense of unease – or even of downright distaste – as they cross the threshold into The Wildgoose Memorial Library: to join me in my explorations of subjects pertaining to the mysteries of the living in relation to the dead (as both subject and object), and the role that interplay between the senses and memory may play in construction of narratives of mortality. 1 Frederick Tatham: ‘The Life of William Blake’ (1832), in: Harold Bloom (ed. ): William Blake, New York 2008, 17-19, here 18. Mystery surrounding origins notwithstanding, from the moment The Cat first arrived it settled perfectly into the shadows of the hallway, where it provides a uniquely lugubrious welcome.